← Njal’s Saga: some concluding remarks. Yesterday, I struck up a conversation with another San Francisco Giants fan about the possible conflict between the National League Championship Series and Monday’s Presidential Debate. The Giants are down three games to two. If they pull off a win tonight, the final game will be Monday. Later, considering which program I want to watch vs. the one I should watch, I thought of how clear it’s become to me that this election is not about the candidates themselves, but about the visions, or perhaps more accurately, the stories about America they embody. Most people seem less than thrilled by the candidates themselves, but everyone takes the stories seriously. A high school history teacher planted the seeds of this understanding decades ago. At the time of another presidential election, he suggested that most voters are swayed by an image of times past, a story of “the good old days,” which probably never existed. He argued that the imagination of the conservatives of his day echoed the television show, Bonanza. 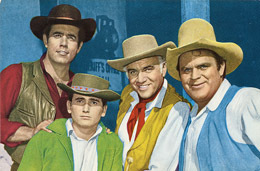 The Cartwrights (l-r), Adam, Little Joe, Ben, and Hoss. Public domain. Ben Cartwright and his three sons carved a fine spread out of the wilderness – they did it on their own, by the sweat of their own brows, thank you very much. The only hint of government was the Virginia City sheriff, and generally the Cartwrights told him what to do and not vice versa. 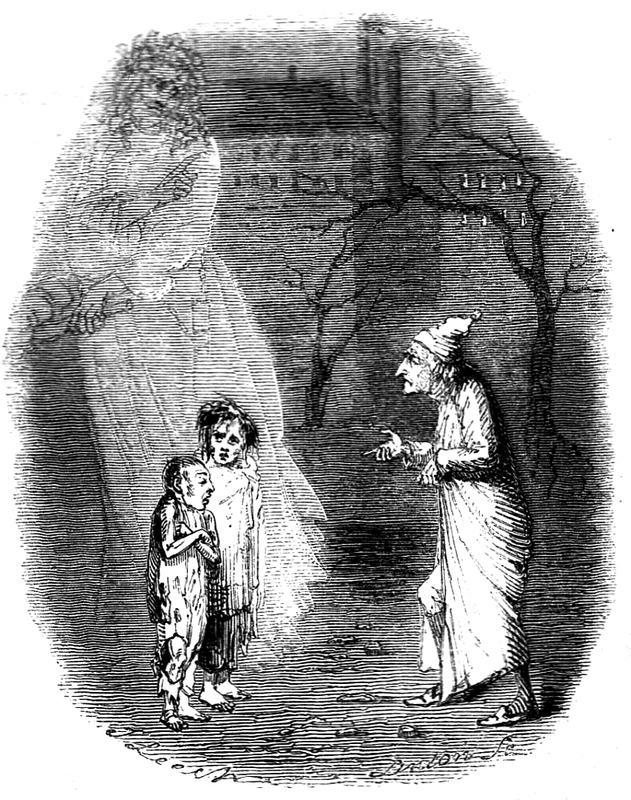 Scrooge meets Ignorance and Want. Public domain. And whenever you hear a politician of any persuasion invoke “family values,” you can bet their story embodies the world of Norman Rockwell. Anyone grow up in a family like this? Norman Rockwell mural. Public domain, courtesy Oregon Historical County Records Guide. We’re dealing with powerful stuff here – nothing drives us more than our dreams, which means we need to be careful. I liked Bonanza and still enjoy Norman Rockwell, but I try not to bring them into the voting booth. Kids learn how to separate dreams from the world of make-believe: they know that “I want to be a doctor” is different from “I want to fly like Super-man.” What kids know, politicians seem to forget. I expect to hear a story that goes like this: “We are number one and if you want to keep it that way, vote for me.” I’m not so sure we’ll hear much about policy, aka, “wise, expedient, or prudent conduct or management.” For that we often have to look to outsiders. I’ve done precisely that over the last few months, and was startled to find a clear and feasible foreign policy articulated with very similar features from both a liberal and a conservative point of view. There’s a beautiful story in there too, one involving national renewal through shared effort and dedication. A dream, to be sure, but it doesn’t require Superman. This will be the topic of a post in the coming week. Meanwhile, though I’ll be watching the debate, I’ll have my phone set to the instant scoreboard app. “The Giants are number one,” is a dream that could happen, but if Superman is listening, we’re not above asking for help! The Giants won, 6-1, so there will be a game 7! This entry was posted in Culture, Current Events, Politics, Stories and tagged 2012, Baseball, Culture, current events, politics, Sports, stories. Bookmark the permalink. If there is a game, I will be watching the game and recording the debate for later viewing. It’s not quite as time sensative for me. A game seven will almost always trump a debate three unless it is literally on the eve of an election. Go,Giants! That’s true, and of course we’ll have plenty of talking heads to give us the one minute summary. Here’s hoping! The artist foreshadowed such racially charged issues in 1936 with “Love Ouanga,” an illustration for American Magazine that accompanied a story by Kenneth Perkins. In the story, which deals with voodoo practices and family honor in New Orleans, Spice, a stylish African-American woman, attempts to win back her illegitimate son, who has been taken from her. Rockwell’s illustration is set at the pivotal moment when Spice enters a room and interrupts a young girl’s prayers. Like many of Rockwell’s works, it amplifies a moment at its dramatic height. 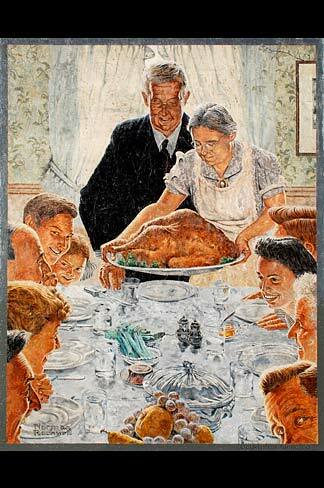 Very interesting that Rockwell would deal with such a theme in 1936. Thanks!